Obama’s rapprochement has overwhelming support from Cuban-Americans, the US business community, and the Cuban people. Of course, Donald Trump will say none of the above, since he is not, to use a political-science phrase, a “rational actor.” Instead, the president plans to use the bully pulpit of the presidency to discredit the Obama policy of positive engagement, denounce the Castro government, and demand that Cuba take specific actions as a quid pro quo for improved relations. In a sure-to-be-futile attempt to coerce Cuba, Trump intends to announce new restrictions on the freedom of US citizens to visit the island, as well as on future commercial interaction. The president’s new, eight-page executive order on Cuba, which Trump plans to sign in Miami tomorrow, will once again unleash US harassment of citizens traveling to the island, subjecting them to a Treasury Department “audit” of the purpose of their travel. US travelers will also be banned from staying at, eating at, or going to cultural events at most state-owned hotels. The new restrictions will effectively limit lodging options for hundreds of thousands of visitors, bringing a halt to the growth in the number of travelers who have taken advantage of the Obama administration’s open-door policy on travel to the island. The new directive also bans the ability of US companies to do business with any Cuban entity controlled by Gaesa, the conglomerate of tourism-related agencies administered by the Cuban military. In both tone and substance, Trump’s new policy will undercut the Obama administration’s meticulous efforts to open a new era of civil and respectful bilateral relations between Washington and Havana. By resurrecting the decades of perpetual hostility that dominated the US approach to the Cuban revolution until December 17, 2014—the day Obama and Raúl Castro announced an agreement to reestablish diplomatic ties—Trump is set to sabotage a historic foreign-policy achievement that has indisputably advanced US national and international interests, and contributed significantly to major socioeconomic changes on the island. Let’s be clear: There is no compelling logic to rolling back a strategic approach that has proven so successful, nor is there any real constituency for changing the policy. Poll after poll shows that about 75 percent of the American public supports the rapprochement with Cuba. That includes the Cuban-American community in Miami, which Trump will be addressing on Friday. 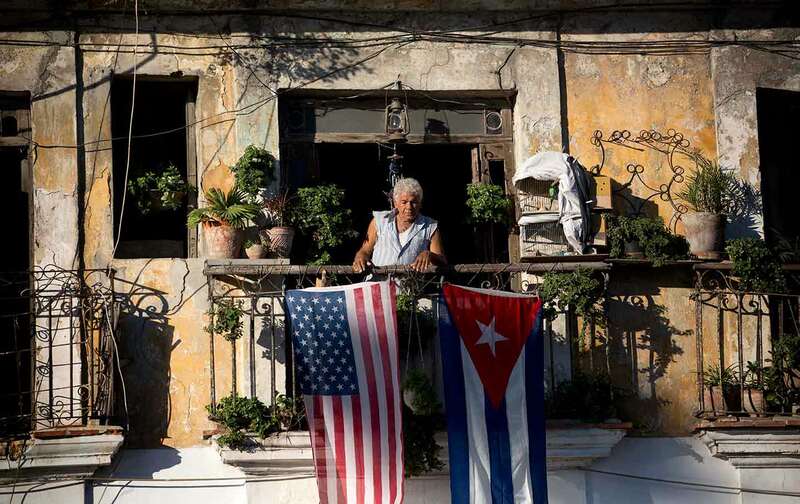 Some 69 percent of Cuban-Americans support the diplomatic opening to Cuba, according to polling done by Florida International University; among younger Cuban-Americans, that figure rises to 87 percent. And 74 percent of the Cuban-American community favors full freedom of travel to Cuba—an unrestricted ability the community received in 2009, in one of President Obama’s first policy initiatives that Trump is now threatening to rescind. Indeed, when it comes to the Cuban-American community, Trump’s decision to roll back the rapprochement appears to cater to only two members of the clique of hard-liners from Miami: Representative Mario Diaz-Balart, who has all but admitted to trading his vote on the American Healthcare Act for a Trump promise to roll back engagement with Cuba; and Senator Marco Rubio, who has parlayed his position as lead Trump protector on the Senate Intelligence Committee—yes, the very committee investigating the ongoing Trump/Russia scandal—into becoming the lead architect of the new, punitive policy. “I am confident that I will be very pleased with what the president will announce Friday,” Senator Rubio stated this week. In the December 17, 2014, prisoner exchange that opened the door to better relations, the United States obtained the freedom of imprisoned USAID subcontractor Allan Gross, as well as Rolando Sarraff Trujillo, one of the CIA’s top moles inside the Cuban intelligence community, who had been imprisoned for over 15 years. Cuba also agreed to release 53 incarcerated political prisoners. The official reopening of a US embassy in Havana means that Washington has institutional representation in Cuba, helping to advance all its economic, political, security, and cultural interests. Among the bilateral structures established since 2014 is a joint task force to negotiate the many outstanding issues between Washington and Havana, among them compensation for expropriated properties and the issue of human rights. The restoration of civil diplomatic ties has resulted in 23 new accords and agreements between the United States and Cuba on fundamental issues such as counterterrorism operations, cyber-security, counter-narcotics collaboration, human trafficking, law-enforcement, environmental management, disaster planning, and migration control. Indeed, the final agreement that the Obama administration signed with Cuba ended the “wet foot/dry foot” policy that, for years, encouraged the type of uncontrolled migration to the United States that Trump has opposed. Rapprochement has facilitated US medical trials of Cuba’s anti-cancer vaccines, creating a potential for a new generation of pharmaceuticals accessible to US citizens for future treatments of this often-terminal disease. The opening to Cuba has allowed major US businesses to pursue economic opportunities on the island, among them Google, AirBnB, and Starwood Resorts and Hotels. The airline corporations—American Airlines, JetBlue, Southwest, and Delta among others—have made serious investments in opening routes, and the cruise-ship industry is running multiple trips per day to various Cuban ports. A recent economic impact study commissioned by Engage Cuba, a coalition of businesses focused on facilitating travel and commerce, estimates that more than 10,000 US jobs have been supported by the expansion of the travel industry, which will generate close to $3.5 billion in revenues in the coming years if travel to the island continues to expand. Despite existing US restrictions on simple tourism, the Cuba opening has facilitated the constitutional right of US citizens to travel. Travel to Cuba has increased by 73 percent over the last year; industry analysts estimate that the number of US visitors could reach 2 million over the next several years if the opening continues and Cuba is able to expand its infrastructure and tourist services. These accomplishments were made possible by President Obama’s decision to abandon Washington’s imperial approach toward Cuba—a failed approach that Trump is about to renew. By adopting a noncoercive, civil, respectful tone in both open and secret talks with the Cubans before December 2014, Obama opened the door to normalized relations that are advancing both US interests and those of Cubans on the island who see, and are seizing, the opportunities for change that positive engagement offers. In less than three years, US engagement with the emerging private sector has done more to help transform Cuban society than five decades of paramilitary interventions, assassination plots, democracy-promotion programs, and trade embargos. Indeed, economic independence from the state—and the daily individual freedoms it allows—represents a substantive advance for the human rights of tens of thousands of Cubans. Further normalization of relations has the potential to significantly expand the number of Cubans who can determine their own economic futures, and free their lives from state control. Both Amnesty International and Human Rights Watch have called on Trump to continue the process of normalization, and even to lift the embargo as a way of removing the threat of US aggression, which reinforces the hard-liners in Cuba’s Communist Party leadership. In a logical world, that is what Trump would do. He would acknowledge the model of foreign-policy civility that his predecessor established, and then take credit for expanding its successful contribution to both US interests and the interests of the Cuban people. That approach, however, would require a rational actor. Unfortunately for the future of US-Cuba relations, that is something Trump will never be.